Were you even a British child in the early 90’s if you didn’t open your lunchbox to reveal a delicious chocolate Wagon Wheel sitting beside your sweaty cheese sandwiches? They were the golden child of the school diners, kids would try and swap their whole lunch for a Jammy Wagon Wheel. Who wants a pink wafer when you can have the bad boy of the biscuit world. Fast forward 23 years and I’m still partial, even though I’m pretty sure they have gotten significantly smaller. That or it’s just my hands have gotten bigger, who knows. After the success of my Jammy Dodger Blondies I’ve been on the lookout for more treats I can splice up into my baked goods. When I saw the recipe for Wagon Wheel Brownies in Olive Magazine I just had to give it a go and cursed myself for not thinking of it first. 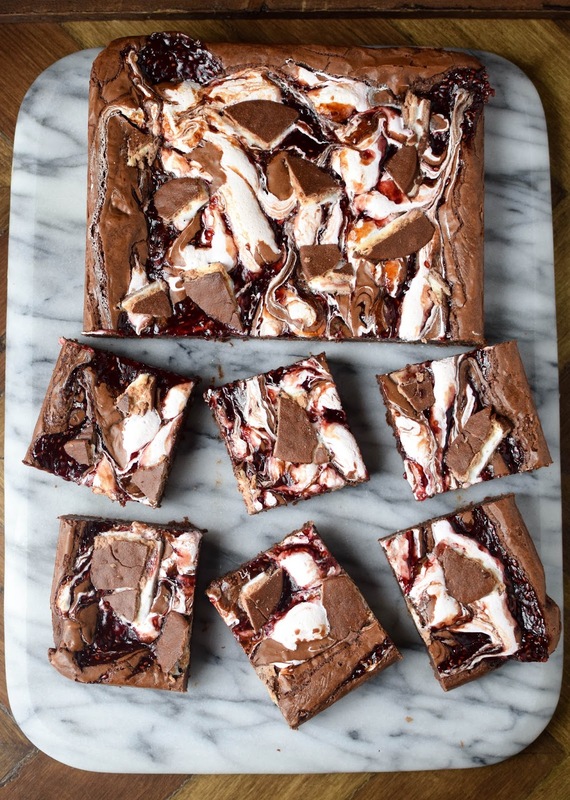 Brownie batter, swirled with lashings of marshmallow fluff and raspberry jam with the periodic hunk of Wagon Wheel. What could go wrong?! This is a brownie fit for a queen. Turn up anywhere with a tray of these babies and you’ll make friends for life. Just don’t blame me when they follow you around demanding more. Brownie batter, swirled with lashings of marshmallow fluff and raspberry jam with the periodic hunk of Wagon Wheel. What could go wrong?! 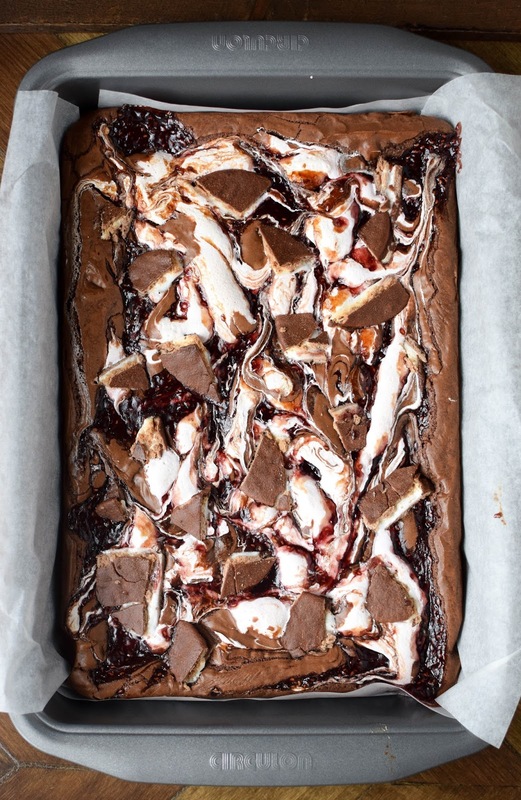 Preheat oven to 170°C and line a 33×23 brownie tin with baking parchment. In a large heavy bottomed saucepan melt the butter and chocolate together over a low heat. Allow to cool slightly. Mix the eggs and sugar together in a large jug and pour into the melted chocolate, mix till combined. Add in the flour and stir until just combined, take care not to over mix at this point. Pour the batter into the prepared pan and smooth out. 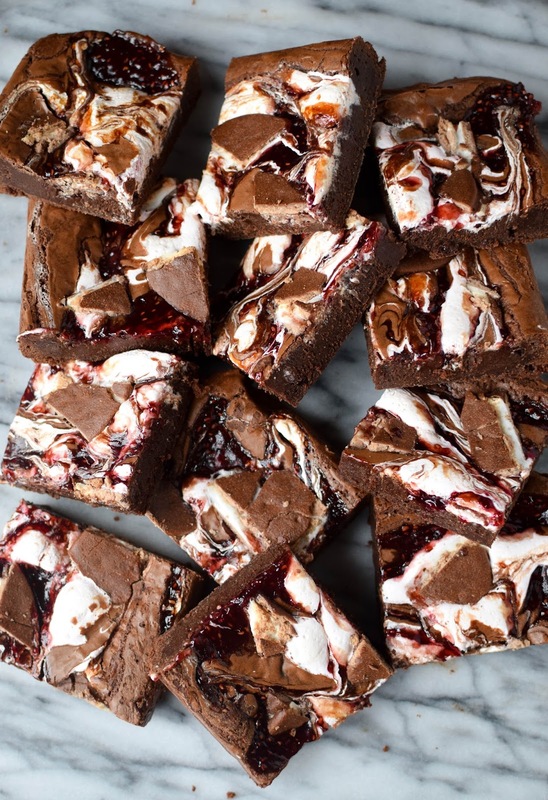 Spoon blobs of marshmallow fluff and raspberry jam over the brownie batter and marble with a knife. 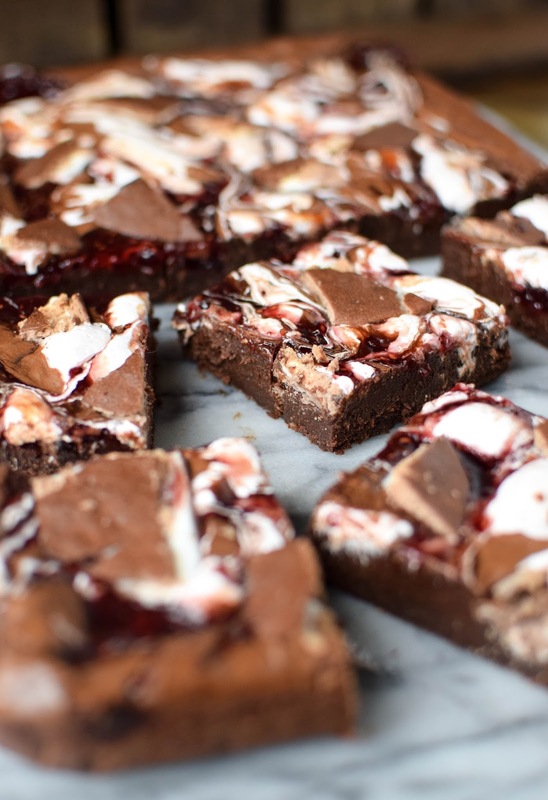 Poke chunks of Wagon Wheel throughout the brownies. Bake for 25-30 minutes or until there is just a slight jiggle in the centre of the pan. Leave to cool completely, preferably overnight in the fridge. Cut into squares and enjoy. Wow, these look insanely tasty. They're oozing jammy, marshmallowy goodness.Since we're on the topic of awesome biscuits, I highly recommend custard creams blondies. I once mixed custard cream chunks into a browned butter blondie batter (a BBC recipe, possibly found through you years ago..?) and it was pretty damn good. These we really have to try! Wagon Wheels will be in the shopping this week! 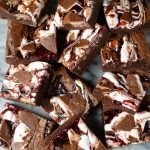 Little man loves wagon wheels so I am sure he would be a fan of these brownies! Amazing! I have things to do today or else I'd be running to the shop to buy wagon wheels! Absolutely looks yummy and I wan't to try this at home this is my kind of food.